BERLIN: Frank Laczko is a leading expert on illegal migration and says the world isn't even close to understanding the scale of the problem or the role smugglers play in it. The smuggling trade is assumed to be vast, with the International Organization for Migration (IOM) estimating it's worth at least $US10 billion (8.9 billion euros) a year. But Dr Laczko, who heads the IOM's Berlin-based Data Analysis Centre, says cold, hard facts are hard to come by and warns sophisticated and effective solutions will remain elusive without the right research. "You would think, given the prominence of this issue, that you would find a vast amount of research and solid statistics," he tells the German news agency DPA. "In fact, it's quite the opposite. Many countries do not even publish official statistics about the scale of migrant smuggling and the number of smugglers. And because it is a clandestine criminal activity, it is difficult to measure." But Dr Laczko says it's clear that in an era of strict border control, migrants find it difficult to enter countries illegally without paying someone to help them for at least part of their journey. The available data doesn't tell us what happens to the men, women and children who put their lives in smugglers' hands. There are no comprehensive figures on how many migrants are exploited or abused on their journeys, how many are diverted into sexual slavery and forced labour, or how many may have died - for example, in the deserts of Africa en route to Libya or during boat crossings to Europe. Dr Laczko says the global community has historically failed to pay sufficient attention to the mass migration of people. "The management of migration has not been given a significant enough priority. Maybe some countries were pretending that it wasn't going to affect them," he says. "There is now an awareness around the world that migration affects most countries, that it needs to be managed much more effectively, and that one country cannot do this alone." In September last year, at the UN General Assembly, member states agreed to work on a new global agreement to enable safe and orderly migration through regular channels. Dr Laczko says discussions about how to achieve safer, legal pathways for migrants will be a "difficult". "But at least they are starting to have this discussion. This is a very important step forward." Q: How many migrants rely on smugglers to move? A: You would think, given the prominence of this issue, that you would find a vast amount of research and solid statistics. In fact, it's quite the opposite. Many countries do not even publish official statistics about the scale of migrant smuggling and the number of smugglers. Also, because it is a clandestine criminal activity and it is difficult to measure, there are no reliable global statistics on this subject. But we do have some evidence. For example, Europol estimated that in 2015 the profits from smuggling migrants to Europe were in the region of 4.6 billion euros ($US5 billion) to more than 6 billion euros ($US6.7 billion). 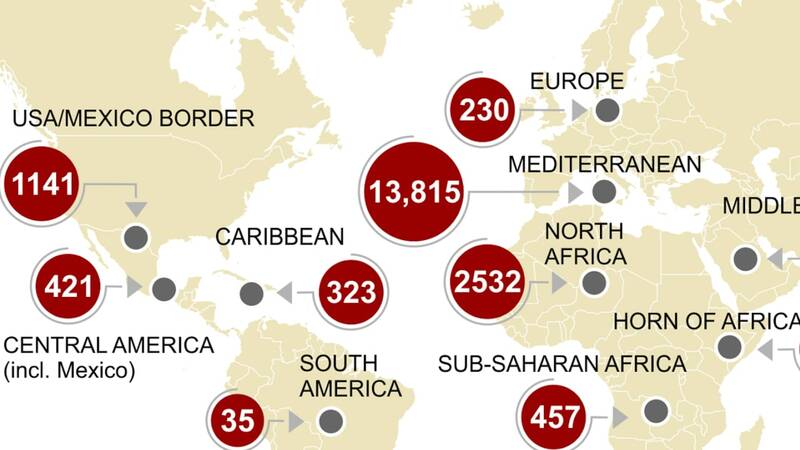 You will recall that in 2015 one million migrants came to Europe. Each of them paid at least $US1000 (890 euro) to smugglers. At the IOM, we estimate that migrants can pay up to $US5000 (4460 euro), or even more, depending on how far they need to travel or which means of travel they use. Q: So we have to content ourselves with estimates? Is easy money the big driver? A: There are huge sums of money involved in this business. It is a relatively easy business to get into. And it's a business where you try to maximise your profits. One way is to put as many people on a boat as possible. It is often said that it is a low-risk, high-reward business. What policymakers in Europe and around the world would like to do is to make it a high-risk and low-reward business. But they haven't been able to successfully do that. A: The EU-Turkey agreement certainly did have an impact on migrant smuggling. According to the Europol centre at The Hague - established recently to collect information on human smuggling - the profits from smuggling may have decreased by around 2 billion euros ($US2.24 billion) as a result of the fall in the number of migrants coming to Europe, particularly along the eastern Mediterranean route. There are many critics of this agreement. But it has had an impact on the smuggling business. And talking about data - the official statistics do not tell us how many migrants were exploited or abused on their trips in Africa, in Libya, or on their way to Europe and other parts of the world, and how far migrants were put at risk. It is very difficult for migrants to enter a country these days illegally without paying someone to assist them during some part of their journey. Q: How well organised is the smuggling business? A: There are some people involved locally who may just take the opportunity to earn some money when they see that there is a demand. But when you come a long distance, from Afghanistan or Eritrea, you are making a long an often complicated journey. Some of them pay most of the money at the end, that seems to be well organised. But there are others who pay for each small part of their way separately, that is less well organised. It is also said that smuggling has become such a lucrative business that it attracts more people. Smugglers themselves are now seeking clients. They go out and advertise their services via Facebook and other social media. Q: What is going wrong worldwide concerning illegal migration? A: Probably the biggest thing that is going wrong is that migration and the management of migration has not been given a significant enough priority. Maybe some countries were pretending that it wasn't going to affect them. What has happened over the last few years is that there is now an awareness around the world that migration affects most countries, that it needs to be managed much more effectively, and that one country cannot do this alone. It requires cooperation between states. A: We have seen a very important development at the UN in the last year or so. Last September, at the UN General Assembly, all the UN member states agreed to work together to develop what is called a Global Compact for Safe, Orderly and Regular Migration. So all the countries in the world agreed that we need to have a more orderly migration system, we need to have more regular channels for migration, and we need to make migration safer. How that will happen remains an open question. Q: Do you think it will be implemented? A: This is something that will be negotiated at the beginning of next year (2018) between member states, and we will see what recommendations they can agree upon and what action they can agree upon. This is going to be a very difficult discussion because it's going to be a discussion involving all countries around the world. But at least they are starting to have this discussion. This is a very important step forward. And there will also be a separate discussion about refugees and a global compact on refugees. Q: What about the short-term picture? A: There will be potentially a continuing flow of migrants from places such as Africa, where the number of young people is set to increase substantially. There will be no shortage of people who will be interested in using the services of smugglers. But if people know that they are unlikely to make it, that they are going to risk their lives by making contract with smugglers, perhaps we will see less smuggling activity. Q: What should governments do? A: Lots of countries have specific action plans to combat migrant smuggling. These include longer jail sentences and fines (for the smugglers). Then there are tougher border controls and better warning mechanisms concerning the risks. Another possibility would be to offer alternatives to the migrants - that is, jobs at home or legal channels for migration. But there have been either no or very few studies on how these policies affect smuggling. Nevertheless, the IOM thinks that there has to be a mixture of approaches. My organisation has a four-point plan for states: offering protection to migrants, addressing the causes of smuggling, more efficient disruption of the activities of smugglers, and better data collection. Q: What would help most? A: Probably, the problems might be solved best through the offer of economic or political opportunities rather than through efforts to interrupt the smuggling activities themselves. When a conflict ends, there is less demand for smugglers. Frank Laczko is the director of IOM's Global Migration Data Analysis Centre in Berlin. The centre was established in 2015 to facilitate the collection, analysis and sharing of data on international migration. 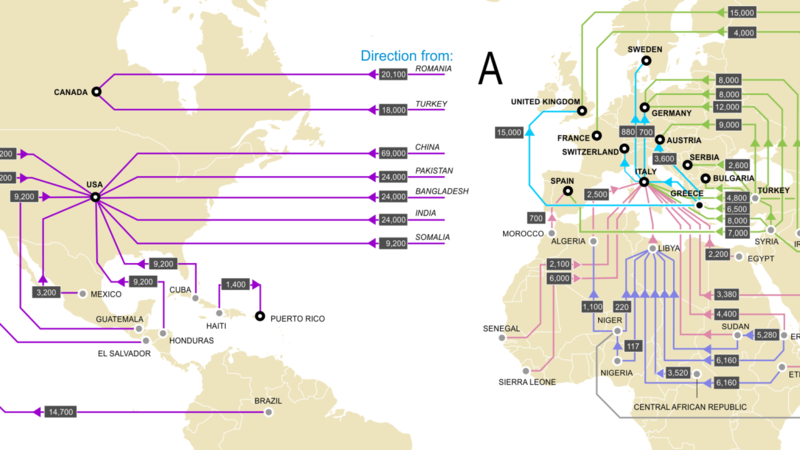 One of its main projects is the creation of a Global Migration Data Portal.